The Sunset celebration is one of those events that you have to attend if you are visiting Key West. You might be wondering what there is to celebrate about watching the sun go down? Can't you do that anywhere? Well, yes I suppose you can, but the Sunset Celebration in Key West is absolutely world famous, and is more of a “happening” than a simple case of standing and watching the sun do its thing....ie Go Down. Within this page, I hope to give you a flavour of what you can expect from the sunset celebration, what time is starts, where the best place is to stand, and all those insider bits of knowledge that I hope you come to rely on at What's At Florida Keys. So let's start with the history and pageantry of the sunset celebration. One thing for sure is the the sunsets have been enjoyed at Key West for longer than is documented. And who could blame the native Americans for sitting on the beach with a nice cool drink in their hand (OK, that is probably taking the image a bit too far) and enjoying the natural phenomena without 1000’s of people flocking around them. It must have been brilliant. Come on Aubudon, you can do better than that I would have thought? Tennessee Williams, and Ernest Hemingway were also the more famous of the visitors that could see the beauty of standing at this Key West spot and saying goodbye to the Sun. But in all honest it wasn't until the 1960’s when Mallory Square started getting a bit of a reputation as the place to go by the flower power hippy movement. The hippies of the time, as you can imagine, were not adverse to a bit of chemical enhancement. Dropping a tab or two of LSD, apparently had quite an effect on the most mundane of household objects or locations, so they started to congregate on the docks at Mallory Square to watch the clouds merge themselves into shapes. Many of the drug fuelled images were to do with the sea, so it wasn't uncommon for the god of the sea Atlantis to make an appearance in front of them. And come on....who wouldn't be impressed by that happening in front of you? So by the end of the 60’s most nights thirty to forty hippies could be found enjoying the Sunset Celebration down at Mallory Square Key West, high on drugs, and happy as Larry. It wasn't the best of starts for a recognized cultural event, but things had to start somewhere. The actual celebration itself started to get going in the late 70’s, when peddlers began turning up each night to sell their wares to the ever increasing crowds of sunset watchers. And you couldn't blame them wanting to make a quick buck, but unfortunately the Key West authorities were less than eager to have people flocking to a dock that really wasn't fit for the purpose. They could see an accident looming in the future, so in 1984 they negotiated with Key West Cultural Preservation Society, Inc. (a not for profit corporation) to start putting some order into the proceedings. And with that the Sunset Celebration in Key West was officially started and for us and all the thousands that have flocked to the dock at Mallory Square night after night since...aren't we glad that they did! What can be seen at the Sunset Celebration? Well away from the world famous key West sunset, you can be certain that you won't get bored down at Mallory Square. It's all a bit mad to be honest, with magicians, acrobats, comedians, knife throwers and even banjo players. So no matter what you fancy spending a few minutes looking at you will be more than catered for. The performers start setting up at a couple of hours before sunset, so its best to start getting down to the docks around 4:30ish or maybe a little later in the summer months to get the best positions to watch them from. To make it easier for you then simply click on the following link for the official Sunset Celebration website, which updates daily as to the time the performers set up and the time the sun goes down. This will make sure that you are there in plenty of time to get the best position by the waters edge. All of the performers at the square are there to entertain, and some travel the world performing their acts at the festivals and fairs across the globe, and therefore are very good, seasoned professionals, who deserve whatever bit of loose cash you can toss their way. Others, it is kind to say, are not as professional and you sometime wonder what they are thinking off.....even tourists are known to grab an area and put on a little show for the masses. But all in all it is good fun, and certainly something to add on to you things to do whilst you are visiting the southernmost island of Key West. Now You Know Where Eric Clapton Goes On Vacation! As we have said numerous times on this page the celebration can be found down at the docks at Mallory Square. 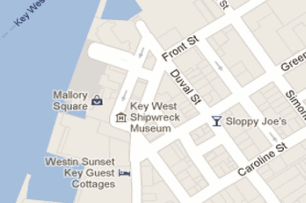 To get to Mallory Square walk down Duval Street or Whitehead Street heading towards things like the very popular Key West Aquarium and the Old Town Trolley Tours if you have been on one these already. 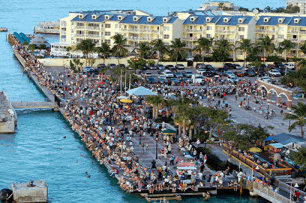 Really as with all things in Key West, the place is built on a grid running from the Atlantic to the Gulf of Mexico, so if you get lost just ask “Where is the Sunset Celebration down at Mallory Square” and you most certainly will be pointed in the right direction. Or of course you could follow the nearest drugged up hippy! Can I Eat And Drink At Mallory Square? There are plenty of restaurants selling food and drink, from standard burgers to pure conch delights, so you won't be hungry if you pop down here to see the goings on. And the beauty of attending the celebration is that its FREE to get in. So if you want to wander away for a little while to visit one of the bars or eating places on Duval Street you can. However I am more likely to grab something from the vendors who set up their little stalls with lots of yummy (and probably not that good for you) stuff to eat. So don't worry about you and the kids, if you decide at the last minute to join up with the nightly revellers, you won't go hungry at all.